The Cub Cadet 524SWE Snow thrower is one of the smaller snow blowers. It is ideal for consumers with small spaces for storage. It may take a little longer to clear the snow, but that is ok, when you have a small space to store your snow blower. This snow blower is only 24 inches wide with a 208cc engine! It has the standard 6 forward and 2 reverse speeds with full chute controls including pitch control. The Cub Cadet 524SWE Snow thrower also comes with an electric push button start. It is easy to for almost anyone to use. It also has trigger controls to help steer the machine. As a result there is no need to have to man handle this machine. Many people are afraid to use a snow blower because they may feel they are not strong enough to control the direction of the machine. With finger tip controls, almost anyone can operate this machine with one hand. There is also an in dash light for night time operation. Consumers will appreciate this snow thrower due to its power, small size and clearing width. Warranty: The 524 SWE Snow Thrower has a 3-year limited residential and 1-year limited commercial warranty. The Cub Cadet 524WE Snow Thrower has 24 inches of clearing width which is suitable for pretty much all urban situations. If you have a really long driveway or a large area to clear you might consider a snow blower with a wider clearing width, if time is an issue for you. This snow blower comes with the standard 6 forward and 2 reverse gears that all snow blowers of this type come with. It also has a 208 cc engine and is a 4 cycle engine. One of the features that many snow throwers come with these days is the Posi Steer system. Unfortunately this snow blower does not come with this feature. 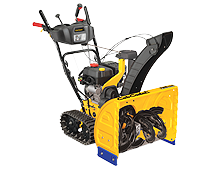 Without this system, it is a bit more difficult to control the direction of the machine and make adjustments in direction as you encounter rutted or difficult areas of snow to clear. Most customers will have to arrange for delivery of their new snow blowers. They are far too big to take home in your car. You will need a trailer, rent a van or arrange for delivery by the store. There will be a charge for this service. But it will be the easiest way to arrange for your new snow blower to be delivered to your home. Some stores will rent their vans/trucks to you for a very low price for 2 hours. This is more than enough time for you to take your purchases home. Lowes and Home Depot do this as well as others. Most snow blowers can be purchased with tire chains to provide extra traction in icy situations. In addition, snow shields are also a good idea. They protect you from windy conditions and snow being blown back at you from the wind. A snow blower is a powerful machine and should be treated with safety in mind. Carefully read all of the safety guidelines in the manual prior to operating the machine for the first time. Follow these guidelines to ensure that both you and the machine do not have an accident. The Cub Cadet 528 SW Snow Thrower / Snow Blower clears 28 inches of snow at a time with a 277 cc engine and 21 inches of clearing height. There are 6 forward and 2 reverse speeds, common to most snow blowers in this class. The chute comes with 4 way pitch control and 200 degree rotation. Features include a trigger pitch control for steering. No more need to try to man handle one of these heavy snow blowers, just press a trigger to change direction. There is also an in dash headlight for night time work so that you can see the snow ahead of you. The size of this snow thrower is perfect for urban situations with not many places for storage. It is still big enough to clear large drifts of snow, yet small enough to store in your garage. This seems like an obvious thing but people still do it and are hurt, sometimes badly, every year. Always turn it off before you do any maintenance. Before you add fuel, check the oil, fix the chains on the tires, or clear the augers of snow. This is the really important part. You have plugged the augers with snow. You have shut the machine off and now you are trying to clear the snow away. Never place your hands inside the augers to get at the snow. Use a broom handle if you have an old machine. Or the snow clearing tool that came with your newer machine to clear the snow. You can also purchase these tools from most stores as an extra if you break yours. Or if you have an older machine which does not have one. This is the safe way to clear snow from around the augers and the impeller. 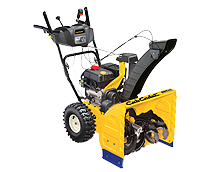 The Cub Cadet 528 SWE Snow Thrower comes with a 357 cc engine and powers a 28 inch wide clearing width that will make short work of your driveway, parking lot and walk ways when it comes to clearing snow. The intake height is 21 inches and the 12 inch impeller and augers are large enough to deal with most snow conditions. This snow thrower also has 6 forward and 2 revers gears which is pretty common in the market for snow throwers and snow blowers. A nice feature is the remote 4 way pitch control and chute rotation which allows operators to direct snow in almost any direction and all from the controls on the handle bars. The tires are 16 inches and provide lots of traction. 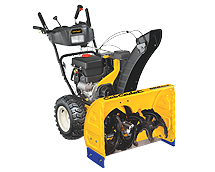 This CC 528 SWE snow trhower also has push button electric start to make it easier for many people to start this machine in cold weather. You also get power steering with this machine with a flip of a switch to change direction. No need to try to manhandle a heavy snow blower, just press the switch. If you blow snow at night, then you will appreciate the in dash headlight to give you lots of light while blowing snow. Use Snow Clearing Tool – This is the really important part. You have plugged the augers with snow. You have shut the machine off and now you are trying to clear the snow away. Never place your hands inside the augers to get at the snow. Use a broom handle if you have an old machine, or the snow clearing tool that came with your newer machine to clear the snow. You can also purchase these tools from most stores as an extra if you break yours. Or if you have an older machine which does not have one. This is the safe way to clear snow from around the augers and the impeller. Like all snow blowers maintenance is important for your machine to operate at a peak level for many years. Change the engine oil regularly. Check the belts for tightness. Change the spark plug as required. Grease any spots outlined in the manual. If you need to leave the snow blower outside all year round, cover the machine with a proper cover. This will keep it looking new and avoid deterioration of the tires and metal components. The Cub Cadet Snow Blower 933 SWE is 33 inches wide and powered by a 357 cc engine. It is 12 inches narrower than the 945 SWE making it more attractive to consumers with large driveways and commercial operations who need a slightly smaller machine with lots of features and snow clearing capability. At 33 inches wide it is a little easier to store than wider machines. It comes with 22 inches of snow clearing height and the standard 6 forward and 2 reverse gears. For those of you who do not like to use the pull chord, it comes with a push button electric starter. There is also push button remote crank chute rotation and remote pitch control which allows you to change direction of the snow leaving the chute at any time while on the go. Change direction of your snow clearing operations with the press of a button with the power steering trigger. No more wrestling with a heavy machine to change direction or keep your snow blower going in the right direction. This is a great snow blower for consumers and commercial operations with it’s large snow clearing width . Prior to starting your snowblower the first time each day, perform a quick walk around check of the machine. Ensure there are no loose parts and no leaking fluids. Check the engine oil to ensure that it is at the correct level as specified by the manual. Top up if necessary. Fill the fuel tank while the engine is cold and prior to using the machine. If you do spill fuel, wait until it has fully evaporated prior to starting the engine. Never spill fuel on a hot engine to avoid fires. Always fill the fuel tank outdoors to avoid any possibility of vapors going into your house. 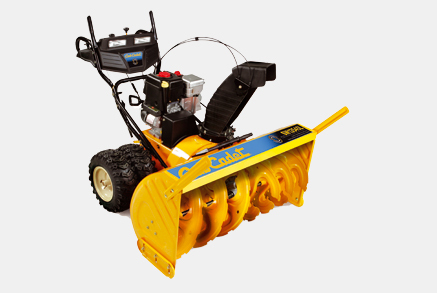 The Cub Cadet Snow Blower 945 SWE has a wide 45 inch clearing width. This will help you make short work of even the largest areas. Combined with a 420cc engine and 22 inch intake height, you can deal with even the largest snow drifts. This is a snow thrower that will also appeal to commercial companies who clear snow as a service. Also companies who need to keep their parking lots and walkways clear for their employees. Note that there is a different warranty for consumer applications vs. commercial companies. This machine has several features which make it easy to use. Such as power steering triggers and power directional chute that lets you change direction on the go. The Cub Cadet Snow Blower 945 SWE is a large 4 tired machine that may be more than what most consumers may need, appealing to those customers who have long driveways or large parking areas to clear. The Cub Cadet snow thrower model SW13545L will handle almost all conditions that you can throw at it. Large snow drifts, long driveways with steep grades are no problem for this powerful snow thrower. With electric start , just press the button and away you go. Use the snow guides on each side to cut drifts for deeper snow. Many operators will be impressed with the power of this heavy weight snow thrower. At 482 pounds and a 420 cc engine, you have the power to handle any snow condition you can throw at it. The deluxe skid shoes and shave plate will ensure that you do not leave marks on your driveway and walkways while shaving the snow down to the surface. 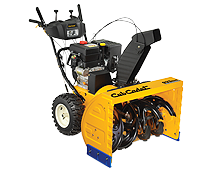 Perfectly balanced to minimize the were and tear on the operator the Cub Cadet snow thrower model SW13545L will be one of the best purchases you can make. 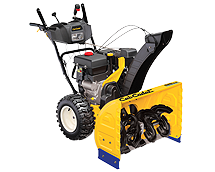 The Cub Cadet snow thrower model SW13545L has a 45 inch cleaning width with a 22 inch intake. The push button start makes this an easy machine to start. Operate with one hand while the other hand operates the chute direction and the chute pitch controls. The Posi steer fingertip controlled power steering makes this machine a dream to operate. This is a large snow thrower weighing in at 478 pounds and operators are reminded to let the machine do the work and you use the controls to steer and drive. Trying to manhandle one of these sturdy machines is too much work and you really do not need to exert yourself in this manner. Long driveways are no problem at night with the dual headlights lighting the way. Home Depot is a authorized dealer for Cub Cadet snow thrower model SW13545L and other snow throwers models sold by Cub Cadet. Customers can pick up there new snow thrower at the local store or arrange for delivery. Rent Home Depot vans for an hour at a time to transport purchased items to their homes. The rates are reasonable and cheaper than having someone make the delivery for you. The Cub Cadet snow thrower model SW13545L is a powerful four tired snow thrower. It can handle all of the large snow drifts you can throw at it. 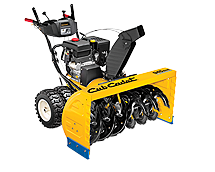 As with all snow throwers, the Cub Cadet snow thrower model SW13545L should be operated with safety in mind. If you are clearing driveways with a gravel base, there is always the chance that stones or ice chips may get picked up and thrown from the chute. Always point the chute away from buildings and cars as well as people. Projectiles of this type can do a lot of damage including breaking windows and causing cuts needing stitches. The manual that comes with the Cub Cadet snow thrower model SW13545L will cover the various safety and operating measures that the operator should take to prevent injury to themselves as well as people around them. Read the manual carefully and follow the guidelines. If you need to clear the impeller or the auger of ice and snow, always shut the machine off first before digging any snow out. Never stick any object into the auger or the impeller. Were tight clothes when using the Cub Cadet snow thrower model SW13545L and avoid wearing long dangling scarves around the snow thrower. Maintenance should be performed by the operator of the Cub Cadet snow thrower model SW13545.. Change the oil in the engine each season or more often depending on the overall use of the machine. Operators should review the manual for frequency of maintenance requirements. If you plan to do your own maintenance on the Cub Cadet snow thrower model SW13545L, first read the manual and if you still have questions, you might talk to your local small engine mechanic or the mechanics that work on these machines for Home Depot. Getting to know your local small engine mechanic is also a good idea. They are a wealth of information and most will be glad to assist in answering questions and giving guidance. Return the favor by purchasing the parts you need from the same shop. Don’t forget to add grease to all of the grease fittings to avoid extra wear and tear on mechanical parts of the Cub Cadet snow thrower model SW13545L. We did not see any online reviews for the Cub Cadet snow thrower model SW13545L online, however feel free to add your comments at the end of this post.